Forty-Second President of the United States, the Honourable William Jefferson Clinton, addressed a gathering of two hundred public and private sector leaders in Saint Lucia at a dinner held in his honour. Mr. Clinton spoke on globalisation, cooperation and AIDS, amongst other issues. 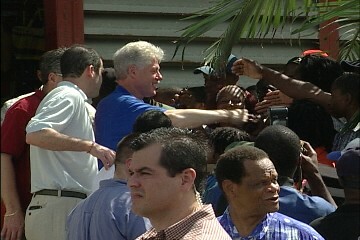 This is President Clinton’s first visit to Saint Lucia. On Saturday morning Mr. Clinton made a stop at the Castries Market, where he was warmly received by Saint Lucians who swarmed to get a look at the former president.